1 of 1 Wrap bottom and side of 9-inch springform pan with aluminum foil to prevent water bath from seeping into pan; set aside. In small bowl, mix together cookie crumbs, sugar and melted butter until crumbs are evenly moistened. Press into bottom and 1 inch up side of springform pan. 1 of 5 In large bowl, beat together cream cheese, sugar, cornstarch and salt for 2 minutes or until smooth and creamy. Put kettle of water on to boil. 2 of 5 Add eggs, beating well after each. Add vanilla; beat 30 seconds. Pour all but 1 cup of filling into prepared pan. 3 of 5 Heat oven to 325 degrees F. Heat chocolate chips in microwave for 40 seconds or until melted. 4 of 5 Stir the melted chocolate into reserved 1 cup filling. Spoon in dollops, evenly spaced, over top of the filling. 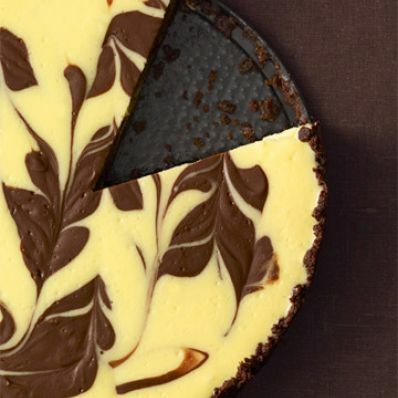 With the tip of a small knife, swirl chocolate dollops into white batter to marbleize. Place cake pan in large roasting pan on oven rack. Pour enough boiling water into the roasting pan to come halfway up the side of the springform pan. 5 of 5 Bake at 325 degrees F. for 55 to 60 minutes or until sides are set and center shakes slightly. Place cake on a wire rack and discard aluminum foil. Run thin knife around edge of cake. Cool completely in pan on rack. Cover and refrigerate for 6 hours or overnight. To serve, remove side of pan.